Santa Fe's weight wellness system. 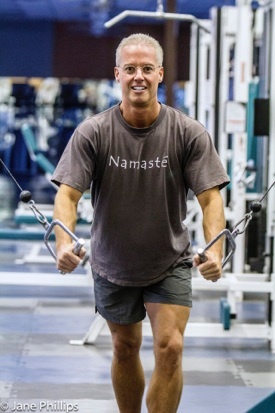 The ultimate goal of Santa Fe Way is to optimize the health and growth of the greatest number of people by helping them achieve their fitness goals within the broader contexts of holistic health and personal growth, the ‘horizontal’ and ‘vertical’ dimensions of a greater integral wellness. The aim of an integral wellness is to embrace and promote all aspects of human health and development. This broad and worthy end is achieved through the comprehensive integration of all relevant sciences, technologies, and methodologies* into a customized total solution according to each person’s unique combination of types, preferences, needs, and goals. The most urgent application of an integral wellness is to address the obesity/diabetes epidemic affecting about one billion people worldwide. Santa Fe Way is pioneering Weight Loss Santa Fe Style™, an integral approach to smart sustainable weight wellness. *Several sciences are integrated in the service of weight wellness: systems biology, environmental health, toxicology, nutritional anthropology, sports nutrition, exercise physiology, evolutionary medicine, integrative medicine, epidemiology (re: degenerative diseases), immunology, psychoneuroimmunology, neuroendocrinology, life-extension sciences, cognitive enhancement, existential & humanistic psychology, health psychology, exercise/sports psychology, positive psychology, and integral psychology. These sciences currently find their application in several technologies dedicated to the actualization of various dimensions of human potential. Santa Fe Way integrates the principles of these apparently disparate fields of knowledge, each corresponding to a single dimension of wellness, into a cohesive, comprehensive whole. It then applies these universal principles to individual clients according to customization variables ascertained through advanced customization techniques. About Santa Fe Way – Think different in The City Different. It’s in Apple’s DNA that technology alone is not enough. Known for attracting intellectual nonconformists, alternative St. John’s College, whose unique liberal arts Great Books Program in the humanities was founded by integral pioneer Robert Maynard Hutchins and philosopher Mortimer Adler, Santa Fe Campus was voted The Most Rigorous College in America in Newsweek’s College Rankings. Santa Fe is home to the world-renowned Santa Fe Institute, the global center of systems thinking, complex adaptive systems, and the new systems sciences. Systems thinking powers the Information Age just as the scientific revolution four centuries ago paved the way for the Industrial Age. Weight Loss Santa Fe Style™ is based on systems thinking and agile action. Santa Fe is one of the world’s largest art markets and the largest art market in the country on a per capita basis. The Atlantic magazine ranked Santa Fe as having more than seven times the national average of artists per capita. Hotwire.com voted Santa Fe the top city for art and architecture: "The community of Santa Fe has long been considered both a haven for creativity and an important gathering place for the American art community." The world-renowned Santa Fe Opera, the first outdoor theatre in America exclusively designed for opera, was founded to give young singers an opportunity to learn and perform new roles. Santa Fe Opera is internationally known for introducing new operas, including 11 world premieres and over 40 American premiers, and has commissioned nine new operas. Likewise, Aspen Santa Fe Ballet’s mission places highest priority on developing new choreography and nurturing relationships with emerging choreographers, including 14 commissioned works by key global dance makers. Moving People Dance Theatre was also created to nurture a progressive dance arts community and to encourage discipline, a healthy lifestyle, and personal growth. Santa Fe was chosen Healthiest City in America by Organic Style Magazine in its ranking of the 125 healthiest cities based on environmental toxins, car exhaust, industrial plants, pesticides, and healthy mind and spirit options. AARP Magazine ranked Santa Fe's rates of diabetes, hypertension, and high cholesterol among the lowest in the country. Santa Fe consistently ranks 1st in the country for air quality and 2nd in the world according to WHO. According to the American Lung Association's State of the Air 2012 report Santa Fe is the only city in America ranked cleanest in all three categories of pollution: short term particle pollution, long-term particle pollution, and ozone pollution. The City Different is home to Southwest Acupuncture College, one of the best graduate schools in the world for Traditional Chinese Medicine. Homegrown Santa Fe Soul features the largest community of complementary, alternative, holistic, and integrative practitioners in New Mexico. Santa Fe is home to well-known integral pioneers and best-selling authors Doctors Barbara and Larry Dossey. Their awards in the fields of holistic and integrative medicine and nursing are quite impressive. Dr. Larry Dossey is a founding member of the Integral Medicine branch of Integral Institute. The New Age Almanac in the early 1990‘s located Santa Fe as, “The Capital of the New Age Movement.” Santa Fe, the city of faith, is home to many who have faith in religion, science, philosophy, psychology, spirituality, or epistemology. Travel + Leisure magazine's "America's Favorite Cities" survey ranked Santa Fe as the #1 place for Peace & Quiet. Santa Fe was also named the #1 Cultural Getaway by Travel + Leisure in 2012. For SantaFeans local is global, global is local ... here that dualism dissolves. This clean, pristine, peaceful nexus of new ways of thinking, creating, healing, and being is what attracted me and many of us to Santa Fe. As one of the few homegrown locally-owned weight loss services in The City Different, this is home to a new approach to weight wellness that is original, unique, and way different from mainstream weight control chains. My interest in health, fitness, and wellness evolved from my background in classical ballet, modern dance, soccer, and swimming. Dance inspired a deep appreciation for the capacities of the human body and the closely related beauty of the human form. It greatly influenced my regard for physical fitness, aesthetic value, and the importance of the mind-body relationship in the neural pathways developed for the motor control and total awareness of the body. Dance requires all the components of fitness: strength, speed, power, endurance, flexibility, balance, coordination, agility, and body composition. According to a study by Dr. James Nicholas, among sixty-one sports and activities evaluated on criteria including strength, speed, and agility, ballet was judged the second most demanding activity, scoring just one point below professional football. I continued my interest in fitness while in college where I trained a girlfriend for the Miss Alabama fitness contest where she won third place in her first contest after nine months of intensive training. I also choreographed her stage performance for the competition. However, my interests extended beyond physical culture. In pursuing a liberal education I was concerned with developing my fullest potential. I was, and am still, fascinated by the relationship between physical and mental fitness, the foundation of a broad full life. the possession of moral goodness in his soul with the outward beauty of his body. I’ve always been captivated by the apparently unlimited possibilities of human potential, expressed on an individual level in a passionate pursuit of personal growth, and on a social level in my work on behalf of social progress through education and progressive public policy. Personal growth and social progress are parallel developmental processes, the ontogenetic and phylogenetic dimensions of development, that have as their ultimate ends the full realization of human potential in the individual and social dimensions of life. I’m especially interested in the connection between these two – the close relationship between self-actualization and the resulting enhanced ability to effect social progress made possible by actualized potential. Personal growth and social progress are inextricably bound: while personal growth is the pursuit of excellence and fulfillment individually, it also benefits one in advancing social progress, which develops human potential socially. The empirical fact is that self-actualizing people, our best experiencers, are also our most compassionate, our great improvers and reformers of society, our most effective fighters against injustice, inequality, slavery, cruelty, exploitation (and also our best fighters for excellence, effectiveness, competence). And it also becomes clearer and clearer that the best "helpers" are the most fully human persons. What I may call the bodhisattvic path is an integration of self-improvement and social zeal, i.e., the best way to become a better "helper" is to become a better person. But one necessary aspect of becoming a better person is via helping other people. So one must and can do both simultaneously. able to endure hardships and fatigue, is to one that will make any figure in the world. I served in the 3rd US Infantry, the Army’s most elite unit (and where I started meditating), to put myself through college where I was elected Vice President of the student body and graduated with honors with a broad liberal arts education. 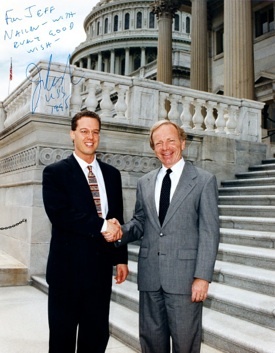 I then served as an Economic Policy Advisor to the Chairman of the Senate Ethics Committee, U.S. Senator Howell Heflin (D-AL), for 8 years. Among the thousands of interesting people I worked with and met in Washington, the three that stand out are Senator Heflin, President Clinton, and the Dalai Lama, the spiritual and temporal leader of the Tibetan people. On Capitol Hill I experienced this relationship between fitness and the ability to serve social progress in the careers of the senators with whom I worked. It’s no coincidence that the President pro Tempore of the Senate, the most senior senator, exercised and swam laps every day while senators who retired prematurely most often did so for health reasons. I saw the vital importance of fitness and longevity in the ability of leaders to shape the course of events and advance human progress. 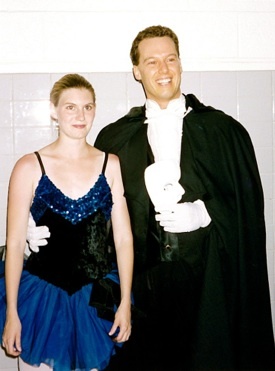 I saw this connection in my work too: while working on the Hill I was also a semiprofessional dancer for Virginia Ballet and Ravel Dance Company, culminating in the lead role of Phantom in a dance production of The Phantom of the Opera performed at Wolf Trap. 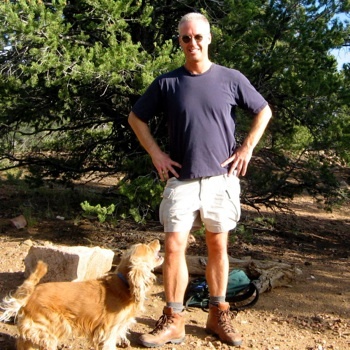 Although my years in DC were great, when I reached the limits of working for someone else I decided it was time to live my dreams so I moved to sunny Santa Fe for grad school at St. John’s College, the ‘Great Books’ school, recently voted The Most Rigorous College in America in Newsweek’s College Rankings. While in grad school I began the post-professional 'free agent' stage of my career by starting the holistic practice I’ve been building since 1996 to bring the weight loss industry into the 21st century by honoring the larger contexts of holistic health and personal growth in which underlying lifestyle and corresponding body weight imbalances are embedded. I have trained and learned from many amazing clients including a Vice President of Intel, successful entrepreneurs, famous artists, professors, psychiatrists, physicians, the highest ranked pro boxer in New Mexico – Joaquin Zamora, and people from 12 to 91 from all walks of life. Becoming a holistic trainer was a paradigm shift from changing the world by changing others through education, persuasion, and legislation, to a postliberal postideological emphasis on improving the world by improving myself while helping others do the same by witnessing metaphysical belief systems as objects of awareness rather than attachment. It’s a shift from fighting the culture wars to witnessing them while realizing that everyone is doing the best that they can given their current level of awareness. Therefore, growing is more effective than fighting, and the best way to grow while helping others grow is to lead by example: “Be the change you seek in the world” as Gandhi said. The integral movement, led by philosopher Ken Wilber, seeks to replace the tendency to fight one another with passionate growth and compassionate service. The freedom and responsibility to create my own destiny as a self-employed free agent is awesome. Free agency allows me to pursue authentic meaningful work and practice right livelihood as an important part of a balanced lifestyle of creative contribution and voluntary simplicity. I absolutely believe in the power to actualize dreams to create a preferred future because I’ve done it and I help others do it. Pioneering Weight Wellness and Positive Personal Training is an exciting and rewarding way to serve others as a change agent: I enjoy inspiring people to help them reach their goals, fulfill their potential, and improve their lives. My core competence is helping people change and grow. Please contact me if you are interested in improving the world by improving yourself while inspiring others to do the same, or if you have questions or would like to meet for a free initial consultation. health from Middle English helthe, from Old English haelth, haelþ "wholeness, a being whole, sound or well," from Old English hāl "hale, whole"
holistic from the Greek holos "whole." Concerned with wholes or complete systems in contrast to analysis of, treatment of, reduction of, or dissection of living wholes into parts. Relating to holism, or 'systems holism,' the idea that the universe and especially living nature is a complex system of interdependent wholes (as of living organisms) that are more than the mere sum of elementary particles due to novel properties not found in constituent parts that emerge at each level of complexity in an evolving system. integral from Middle French intégral "of or pertaining to a whole," from Middle Latin integralis "forming a whole," from Latin integer "whole"
The whole is more than the sum of its parts. The desire and pursuit of the whole is called love. A human being is part of the whole, called by us universe, a part limited in time and space. He experiences himself, his thoughts and feelings, as something separate from the rest, a kind of optical delusion of consciousness. This delusion is a kind of prison for us, restricting us to our personal desires and to affection for a few persons nearest to us. Our task must be to free ourselves from this prison by widening our circle of compassion to embrace all living creatures and the whole of nature in its beauty. “Familiar as the voice of the mind is to each, the highest merit we ascribe to Moses, Plato, and Milton is, that they set at naught books and traditions, and spoke not what other people but what they thought. A person should learn to detect and watch that gleam of light which flashes across his mind from within, more than the lustre of the firmament of bards and sages. Yet he dismisses without notice his thought, because it is his. In every work of genius we recognize our own rejected thoughts: they come back to us with a certain alienated majesty. Great works of art have no more affecting lesson for us than this. They teach us to abide by our spontaneous impression with good-humored inflexibility then most when the whole cry of voices is on the other side. Else, tomorrow a stranger will say with masterly good sense precisely what we have thought and felt all the time, and we shall be forced to take with shame our own opinion from another. drown out your own inner voice. And most important, have the courage to follow your heart and intuition. What’s striking about Steve’s call to follow your heart is how identical it is to Emerson’s. 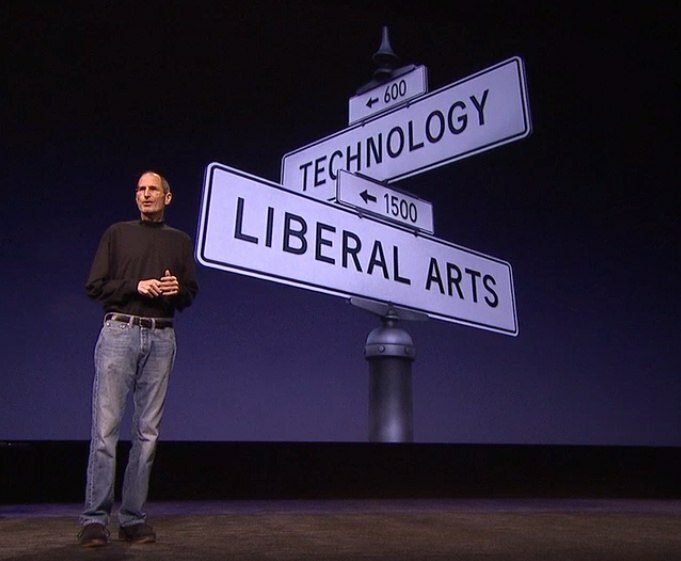 “I think our major contribution was in bringing a liberal arts point of view to the use of computers. it's something everyone should know how to use, at least, and harness in their life. It's not something that should be relegated to 5 percent of the population over in the corner. “Here's to the crazy ones. The misfits. The rebels. The troublemakers. The round pegs in the square holes. The ones who see things differently. They're not fond of rules. And they have no respect for the status quo. You can quote them, disagree with them, glorify or vilify them. About the only thing you can't do is ignore them. Because they change things. They push the human race forward. While some may see them as the crazy ones, we see genius. Santa Fe Way, and the website you are viewing, were created on a Mac in Santa Fe, New Mexico. represented by a bitten apple. was also written off in the 1990’s as crazy, an idealist, a rebel, a dreamer. He insisted on following his heart instead of the small minds who did not see what he saw. May we all find the same courage to believe in the beauty of our dreams. New! Members of New Mexico GREEN Chamber of Commerce save 10% on all packages. and save up to $719 on your own ‘Go Green from the Inside-Out’ Weight Wellness project. Photos from top of the page: U.S. Olympic gold medal gymnast Gabrielle Douglas flies into history as the first woman of color of any nationality and the first African-American gymnast in Olympic history to become the Individual All-Around Champion. 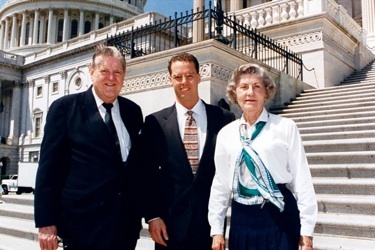 Jean, my first trainee, in a fitness contest; Jeff with Sen. & Mrs. Heflin on the Capitol steps; Jeff with Sen. Lieberman; Jeff and another dancer ham it up backstage after "The Phantom of the Opera" at Wolf Trap; and hiking with ‘Grumpy’ in Santa Fe. of honoring the contemporary over the conventional. Santa Fe Way Weigh different. Personal Trainer Santa Fe Style™ • Weight Wellness Coaching™ are Santa Fe Way™ innovations.